I felt like eating lots of citrus today, and my old dislike for grapefruit has changed and blossomed into a new thing that I love. Are you enjoying the citrus season? I've been juicing oranges and other citrus like crazy -- fresh squeezed juice is the best. I'm loving blood oranges with fennel and onions. Can't get enough! I did an entire citrus-inspired post last week. Definitely helping brighten my winter! I love citrus but I'm always thrown off by the season. It's such a summer fruit in my heart that I can't fully fathom cold oranges in the Winter. But I love them nonetheless. I'm loving pink grapefruit in salad with spring mix, red onions, and avocado. Mmmm. And the citrus looks so pretty against that blue-green background in the photo you posted. I'm notorious for juicing lemons for homemade lemonade year-round! 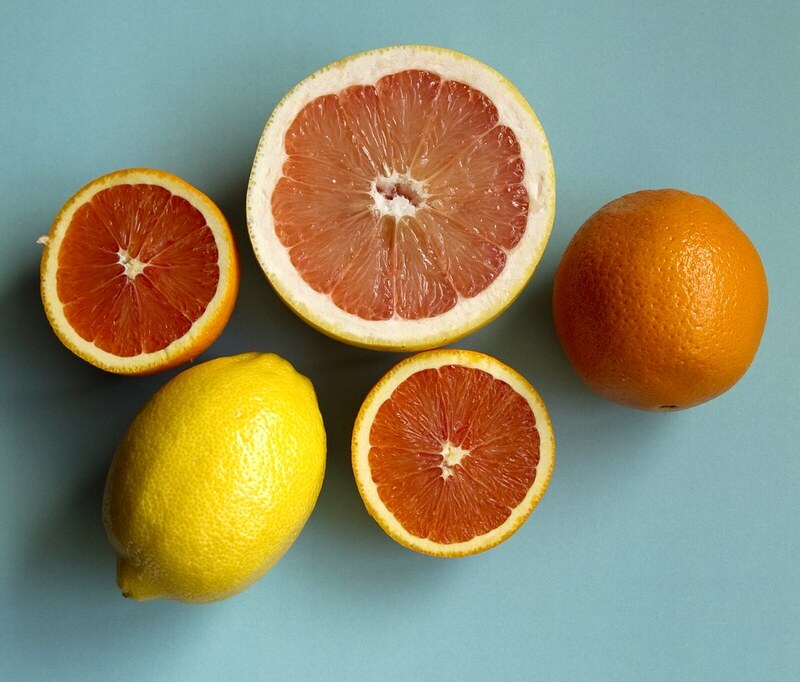 Grapefruits have recently become one of my favorite fruits! Try making homemade orange grapefruit juice. Simple, but so delicious! and btw. i don't think i've said yet how much i enjoyed meeting you at alt summit, but i really did. Citrus is my favourite. Grapefruit and sanguinello especially! i've been loving grapefruits too lately. i need to try some more blood oranges. yum! Have you heard of Cara Cara oranges? They are all over the grocery stores right now. Apparently, they are a hybrid fruit (orange/grapefruit/raspberry) and are honestly the best tasting citrus...ever. I love this photo and citrus. Last year I tried making(and eating) orange marmalade for the first time. It was fantastic. I looked forward to it on buttered toast every morning. I highly recommend it. amazing photo! incredible and inspiring colors! first of all your photo is gorgeous! we're eating loads of citrus lately...i love grapefruit and the girlies and i just made a big batch of fresh squeezed lemonaid. May I ask what kind of camera you use? okay its going to sounds nuts but THE BEST thing with grapefruit is a little brown sugar and then pop it into the microwave for a few seconds ... which makes it REALLY juicy and the brown sugar is SO much better than regular. I am really excited -- because that one of the first shots I took with my new camera, a Canon 7d. Thanks everyone for your kind and inspiring citrus ideas! Nothing poses for a camera quite like citrus! Beautiful photo.